Sixteen years after it received the Oscar for Best Picture, Forrest Gump finally has been officially designated as an all-American classic. No kidding: On Wednesday, Robert Zemeckis’ 1994 box-office phenomenon appeared alongside 24 other “culturally, historically or aesthetically” significant films on this year’s list of selections by the Library of Congress for inclusion in the National Film Registry. But you know what? That doesn’t mean the movie’s haters won’t keep on hating. 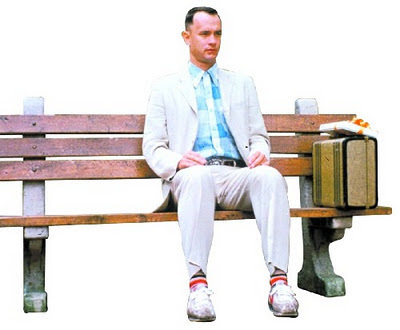 Indeed, judging from some of the initial reactions throughout the blogosphere to the National Film Registry honor, Forrest Gump remains, in the eyes of its harshest critics, sentimental hokum at best – and right-wing propaganda at worst. The latest attempts to attack Forrest Gump for real or perceived political incorrectness remind me of two conversations I had with Tom Hanks – the man who earned an Academy Award for memorably playing the movie’s title character – within the space of a year spanning from June 1994 (a few weeks before Forrest Gump opened at theaters and drive-ins everywhere) to June 1995 (less than three months after the Gump-dominated Oscarcast notoriously hosted by David Letterman). The first encounter occurred in a posh suite of a Los Angeles hotel during a well-attended press junket for Forrest Gump. The second was at Johnson Space Center, during an equally hectic junket for Apollo 13. Back in the day in Los Angeles, I had a one-on-one chat with Hanks after he completed what turned out to be a not-entirely-pleasant cluster of round-table interviews. Hanks and I are not exactly bowling buddies, so, then as now, I’ve based my impressions of him – as a human being rather than a versatile actor –almost entirely on my observations of his behavior at press gatherings. And at those gatherings, he’s always struck me as one of the more gracious professionals in showbiz. Throughout the group interviews I observed, Hanks and director Robert Zemeckis seemed genuinely shocked by any suggestion that they had any sort of hidden agenda. As they saw it, Forrest Gump was an engagingly whimsical and resolutely apolitical story of a slow-talking, slow-witted Southerner who wanders through four decades of American history, touching the lives of both the great and the obscure. Yes, Forrest displays courage under fire while serving as a soldier during the Vietnam War. And, sure, he doesn’t protest against the war after his return home. But, hey, that doesn’t mean he’s meant to represent President Nixon’s so-called Silent Majority. OK? But what about the scene where Forrest attends a late-1960s anti-war rally in Washington D.C., and has an edgy confrontation with some impolite activists? “You know,” Hanks replied, choosing his words carefully as we conversed in his suite, “probably a huge percentage of people involved in anti-war demonstrations really were snarly, ego-tripping assholes. They were equal to the number of beautiful flower children who were truly bent on saving the world. Over the next several months, however, Hanks learned the hard way that, sometimes, “message movies” are in the eye of the beholder. Forrest Gump went on to be a much bigger hit than Tom Hanks (or, for that matter, Robert Zemeckis) ever could have hoped or expected. At the same time, though, Hanks noted, much to his dismay, that the movie was indeed frequently judged -- by commentators on both sides of the political spectrum -- as a warm-and fuzzy embrace of conservative ideology. Hanks added that he was especially miffed by Sen. Robert Dole’s effort to lionize Forrest Gump as entertainment that upheld traditional family values. Dismissing “Mr. Dole’s political grandstanding” as “ludicrous,” he wondered aloud: Forrest Gump is in the forefront of good, quality family films? OK, let’s see. Forrest Gump’s mother [played by Sally Field] slept with the principal of the school so Forrest could go there. I guess that must be forgotten in the course of choosing family films. That and the fact that Forrest fathers a child of wedlock” with his sweetheart, played by Robin Wright. And yet, Dole wasn’t the only person who read Forrest Gump as a movie with a stealth agenda. Many commentators on the right lauded it for the same reasons (or, perhaps more accurately, the same perceptions) that led many commentators – and, yes, film critics – on the left to blast it. “OK, I’m four years older than you. And under most circumstances, that age difference would be insignificant. But because of that difference – I had to worry about being drafted during the Vietnam War, and you didn’t. People my age and older grew up with Vietnam hanging over our heads during most of our formative years. And so for many of us – maybe most of us – the Vietnam War was the defining event in our lives. So every time we see or read anything that involves the Vietnam War – we’re going to instinctively parse it for any kind of political commentary or interpretation. Hanks nodded silently, considering what I had said. He didn’t immediately agree. Nor did he disagree. But he acknowledged that his own view of the Vietnam War was not “the same point of view of somebody who had to live in fear of his [draft] lottery number coming up. No matter what happens, I am ex post facto. Echoing his words from a year earlier, Hanks added: “I have no affection for the ‘60s whatsoever.” By the time the tumultuous decade ended, he was a high school student in Oakland, California. “And I was not on the cutting edge of a social revolution, or a sexual revolution. I was essentially a very confused kid. And by the time I was walking home from school, kind of cognizant of the greater world around me, the sky was full of helicopters dropping tear gas on the people at Berkeley during the People’s Park demonstrations. Huey Newton was in jail for a couple of murders. Which most certainly was not an unreasonable response, as anyone who lived through that era will tell you, regardless of how they felt about the Vietnam War, if they’re entirely honest. On the other hand: Many of the movie’s most virulent detractors will insist that their contempt for Forrest Gump has nothing to do with politics, and everything to do with sentimentality. They simply don’t like it because… because… well, because they don’t like it, period. And as I learned a long time ago, you can’t really argue anyone into liking a movie that they don’t. Especially if that movie beat a movie they liked a lot more – did somebody say Pulp Fiction? – in the battle for the top Academy Award. My own reaction? Well, I greatly enjoyed Forrest Gump when I saw it back in 1994, all by myself in a small theater on the Paramount lot in L.A. (No, I’m not that important: The studio arranged a private screening for me only because I arrived late from Houston, and missed the screening all of the other junketeers attended.) I felt just as favorably disposed toward it when I saw it a second time in an H-Town multiplex a few months later. And I included it on my Top Ten list – alongside Hoop Dreams, Four Weddings and a Funeral, Eat Drink Man Woman, The Shawshank Redemption, Quiz Show, Fresh, Nobody’s Fool, Colonel Chabert and, yes, Pulp Fiction -- for 1994. But I would be less than honest if I didn’t admit that, outside of catching the random glimpse of this scene or that scene while channel surfing, I haven’t seen it again since it won its Oscar. Haven’t had the time – or, really, the inclination. Too many new movies to see, too many old movies to catch up with.